"FieldClock is going to revolutionize the way we do harvest." Take the management burden off of your field staff by giving them a tool to make their lives easier. FieldClock is an easy-to-use mobile app that does the heavy lifting for your people in the field and your people in the office. Let your staff get back to managing your business rather than time cards and piece tickets. We could try to explain to you why it's awesome, but we think you're better off just seeing for yourself. 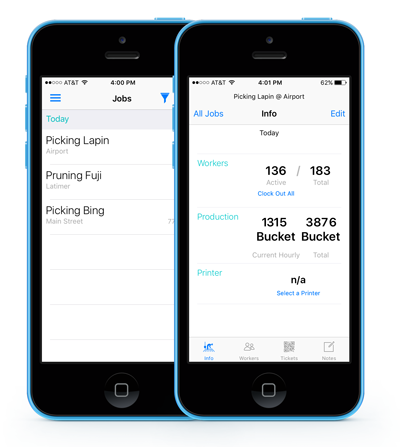 FieldClock is a labor of love, designed by farmers. We know the parts of the job that cause the most headache, and we've gone out of our way to build an app that makes those parts easy. No complicated menus, no long lists, no typing! FieldClock enables your employees to do what they do best without getting in their way. Calling your staff for production updates is a thing of the past. Hours and production data from the field are automatically synchronized with our server to provide you with real-time updates wherever you are. Download your payroll information from FieldClock to your accounting system with the click of a button. We currently offer integrations with Quickbooks, Farmer's Office, Compu-Tech, and Famous and are working on more. Don't buy expensive, custom hardware. Don't get locked into an expensive contract. FieldClock is available on iOS and Android devices.1 Give it a try on your phone now! FieldClock is going to revolutionize the way we do harvest. We live in a world that is becoming more and more intertwined with technology and the agriculture industry is no exception. FieldClock is making sure we're not being left behind and it shows that it's not only achievable but if done right we can be very successful. FieldClock es un programa poderoso que es muy fácil de usar. Al principio pensé que iba ser algo complicado, pero al correr de una semana aprendí todo lo que necesitaba para usar el sistema. Si se nota que el program fue creado por un ranchero que sabe todo la qué pasa en una huerta. Me da gusto que mi patrón sea una persona avanzada, y quiera implementar estos tipos de tecnología. FieldClock me ahorra bastante papeleo y también al final del día. Todo mis trabajadores aprendieron el sistema rápido, y les da gusto que nuestra compania invierta en nuestro futuro. La aplicación está bien fácil de usar, Cualquier persona puede enseñar fácilmente y muy rápido. El sistema elimina las tarjetas de tiempo, los tickets durante la pista y me ayuda a ser más eficiente con mi tiempo en el l campo. FieldClock is going to make us more efficient in the field with payroll. We started using FieldClock during the peach harvest season and ever since then we have continued using the app through all the other harvest seasons. The easiness of the app and the option to use the Spanish language has made it convenient for the crew members to use. It has saved a lot of time and labor and because of that we will continue to use the FieldClock. FieldClock has made payroll so much easier. We have access to more accurate labor costs and employee production statistics that better enable us to make business decisions. We are able to access so much more information by using this labor tracking program than we ever have before. Using FieldClock has cut our time in half, if not more, on payroll entries. The input errors from unreadable handwritten records are no longer a concern. Crew bosses are happy on how much of their paperwork has been omitted by using Fieldclock. The account set up and training was excellent and very helpful for a successful implementation. We decided to go with FieldClock because of the ease of the program. We were also encouraged by the fact that the people that designed the program are also in the same industry. They understand how it works in every aspect. They have gone above and beyond to assist us with training our employees and are always checking to make sure everything is going well for us. FieldClock has made our cost tracking extremely efficient. Our harvest #’s have been incredibly accurate and have saved our crew bosses countless hours by not having to sort and add up picking tickets. FieldClock has been a great addition to our farm. From the very first meeting to day to day application the entire team has been amazing to work with.We discovered that our employees had been rounding there work day up to the next hour. So an employee that worked 8.10 hours would claim 9 hours. Once we discovered this we ran a little math scenario and discovered that this could amount to an extra $80,000 a year in hours we would be paying employees for hours that were not worked!! Incredible. The ability to track all sorts of data is a critical part of our farm, Fieldclock gives us the tools to do this. They have really spent the time to make this a tool that the farmer can use. FieldClock gets 5 out of 5 stars in my book. We found FieldClock at the 2017 NW Hort Expo. Once we got our implementation up and running, it was very obvious that the app was created by orchardists for orchardists. We appreciate FieldClock's willingness to listen to our suggestions and to work with our HR/Payroll vendors. Additional clients include Kyle Mathison Orchards, Chiawana Orchards, Finley Orchards, and Sundquist Fruit LLC. Farmers making life easier for farmers. © 2015-2019 FieldClock LLC. All Rights Reserved.